While shifting compost you feel a little nip on your stomach. A closer inspection reveals that an ant is the source of the nip, and actually you’re covered in hundreds more of these tiny bitey specks. They’re swarming into your boots and up your trousers all hell-bent on burying their pincers as deep into your flesh as possible- and although you are the higher species (with the intellectual capacity for building cities and sending dogs into space), you have no recourse against such a large army. They work their merry way up your neck (still chomping on your skin) and then the mosquitoes (determined as ever to get in on the action) buzz under the rim of your hat to poach blood from the capillaries on your forehead. Nature can be incredibly beautiful sometimes. 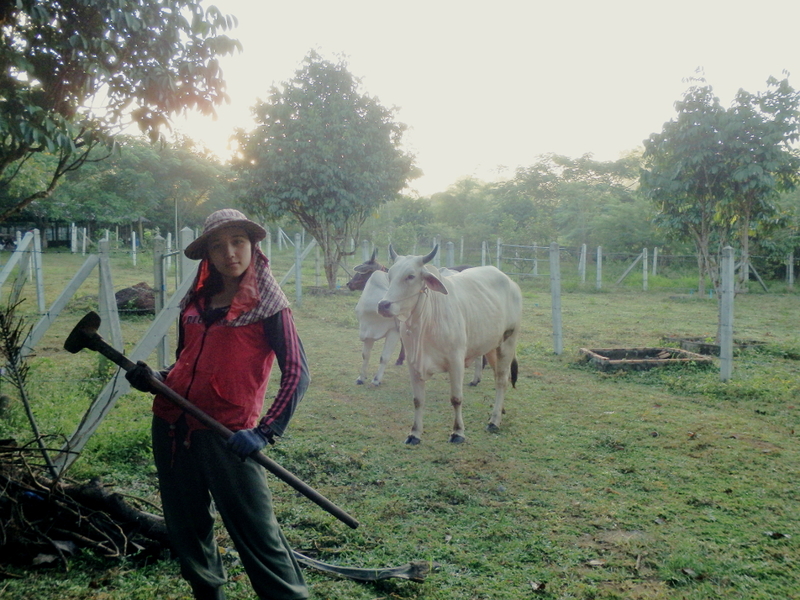 At the farm, with the resort owner’s massive pet cows (yes- PET COWS) in the background. Manual labour in 30 degree weather (and those clothes) was a very sweaty experience. After a quick trip to the bathroom, the battle with the ants ends in a decisive victory for the human (higher species, remember- and bigger hands). Lots of ant heads remain embedded in your flesh, but the mosquitoes aren’t deterred by the carnage. Oh no, the mosquitoes are quite happy to bite through your two layers of clothing (see photo above) plus deet. 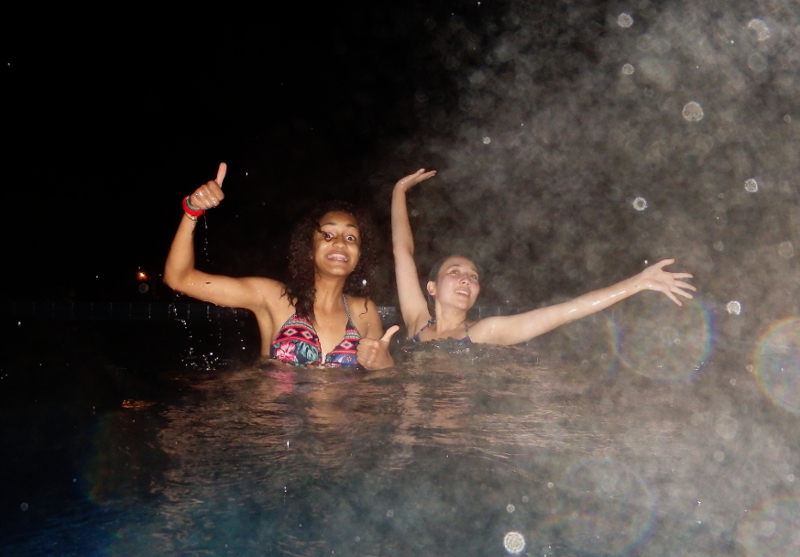 A night-time swim during a thunderstorm- not very safe in hindsight. Another interesting occurrence here at Chanthaburi included being stopped by the police (ostensibly for being the only farangs in the entire town). The three officers began addressing you in Thai, and panic flared in your stomach as you realised you didn’t have a copy of your passport in your bag. One of them mimes taking a photograph, and then the three of them freeze in Action-Man poses, arms akimbo and back iron-straight. A teenage boy snaps a photograph on a mobile phone and then they all walk off. You and your friend share a nonplussed look. “I don’t understand what just happened.” She says. You give her a shrug, and then scratch absent-mindedly at a mosquito bite. If you haven’t read my post on HelpX and working abroad, click here. I spent a grand total of 900 baht for a week at this beach resort (£17 or $28) including meals! So you call this a vacation? Growing up on a farm in Minnesota with all of the critters you describe, it reminds me of why I left the farm for Cali. Don’t get me wrong, if I was your age and wanted to travel on little money, I would be there with you. Just one suggestion, keep a close eye on your health. There are microscopic critters that can make you very sick in those climes. Ah yes, the flesh-eating bacteria and brain-eating amoebas. I’m really hoping I won’t be that 1 in a million traveller who gets infected. Wow sounds briiliant . We have just et up this blog now amd are planning on going to Thailand next. Haha, this is excellent! Godspeed!